The skies may soon be abuzz with package-delivering drones, and not just 'copters belonging to Amazon. 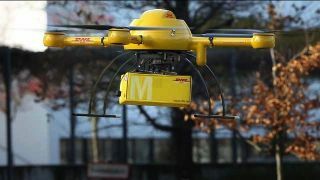 Deutsche Post DHL, a German express delivery and mail company, is testing a pilotless flier called the Paketkopter. Today the chopper successfully carried medicine from a Bonn pharmacy across the Rhine to DHL's offices. Flying at a height of 50 feet, the drone traveled one kilometer in two minutes, according to The Local. This was just a test flight and a full-scale launch of the service, which can carry loads up to 6.6 pounds, isn't on the docket anytime soon. "We are at the beginning of the research project," Ole Nordhoff, a DHL manager, said. "It is an exciting bit of technology." Attack of the blips! More news nuggets await the brave.